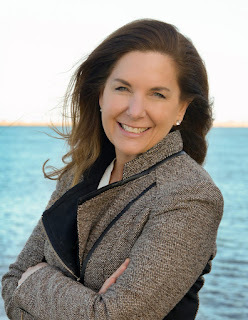 Sea, Sand & Sky: "Don't stick your hands in the harbor water!" Some education happened at the Children's Museum this week that directly relates to what Save the Harbor does! One morning we were greeted by a mother and her daughter as she went to put her hands in the touch tank that was full of water. The mother's immediate reaction was to say "Don't stick your hands in the dirty harbor water!" 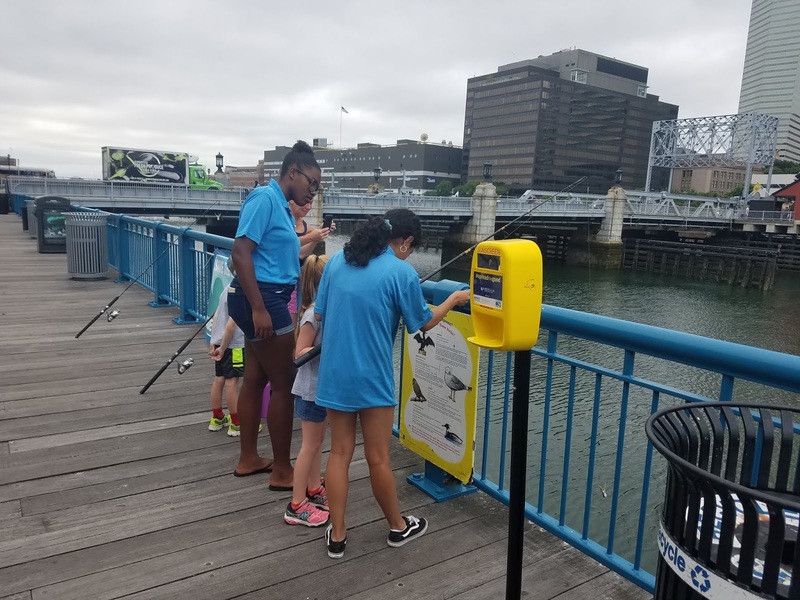 which allowed for LHE Ellen to educate them on how clean the harbor actually is. Afterward she said she had no idea the water was that clean and that they would definitely be more eager to get into the harbor! We were also able to continue educating people on the different fish and crabs we catch. 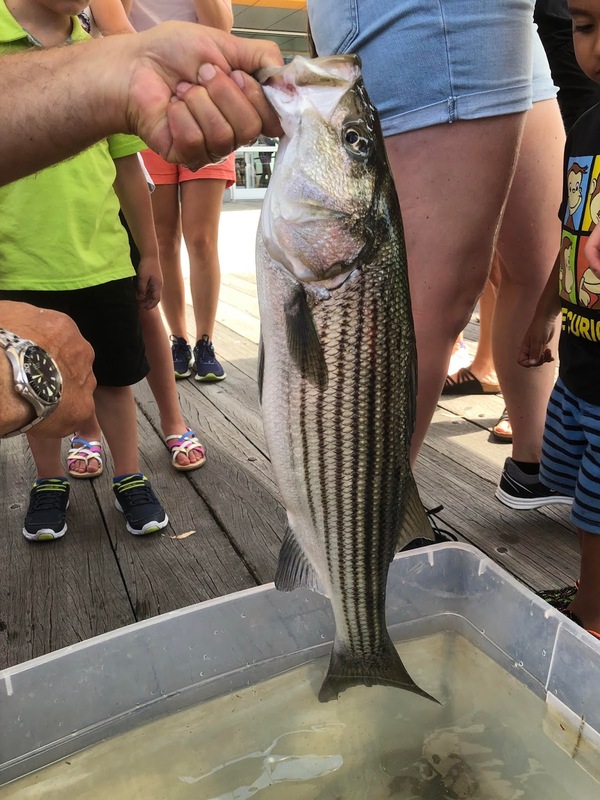 Up until this week we had only caught one striped bass that was almost as big as our touch tank; all other fish had been only a few inches in length. Tuesday afternoon we caught our biggest fish yet! 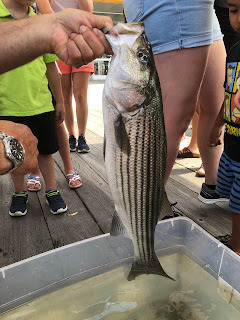 A 25 inch striped bass! The girl who had caught this fish was having difficulty bringing the line in so JPA Imani stepped in to help. She wrestled with the fish, trying to haul it out of the water, for what seemed like ages, until finally the fish had given in and she was able to pull it up! Trying to unhook the striped bass! I brought the fish into the tank (which it was too large for) and grabbed pliers from our tackle box to begin working at dislodging the hook. As I worked at getting the hook out a group of about 50 people circled around me and the monster fish. This fish was thrashing around the tank and getting water on everyone around me. 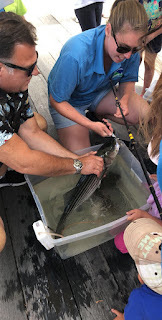 The awesome striped bass we caught!! An avid fisherman saw I needed help holding the fish and stepped in to help me get the hook out so we could release this fish without harm. Once the hook was out he grabbed it and the girl who had caught it was finally able to get a good look at the huge fish she had just caught. Everyone surrounding us moved to the railing as we went to release the fish, and even though fish don't have hands, I could swear it was waving goodbye as it flopped back into the water! 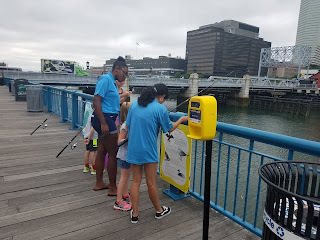 Even though we did not catch another fish this big the rest of the week we were able to celebrate the Boston Children's Museum's 150th birthday with ice cream and a ton of sticky fingers as kids came to fish as soon as they finished their ice cream! I cannot wait to see what's in store for us next week!